This is an old recipe from Stefan's family for Greek keftethakia pork fried meat balls – one of the more well known Greek dishes (“kεφτεδάκια” in Greek). Keftethakia are usually referred to as “keftethes”. The word, “keftethakia”, literally means a smaller version “keftethes” (“akia” at the end of a word in Greek means “small” in the plural). 1. Mix the meat in a bowl with the vinegar and the ouzo (if using). The alcohol in the ouzo gives the meatballs a fluffy texture. 2. Make a well in the middle, then add the chopped parsley, mint, oregano, salt, pepper and cinnamon. 3. Grate the onion and add to the mixture in the middle. 4. Peel the potatoes, then grate them into the mixture, including any liquid from the potato. 5. Remove the crusts from the bread, soak in water and squeeze dry with your hands, then add this to the mixture in the middle. 6. Lastly, beat the egg and add this to the mixture in the middle of the bowl. 7. Scrunch the mixture and mix it up well, then cover and put in fridge for 30 minutes for the ingredients to bind. 8. Retrieve the bowl and shape the mixture into balls either round or finger shaped. Dust them with flour to prevent them sticking to each other. 9. Pre-heat oil on a saucepan then reduce heat to medium. 10. 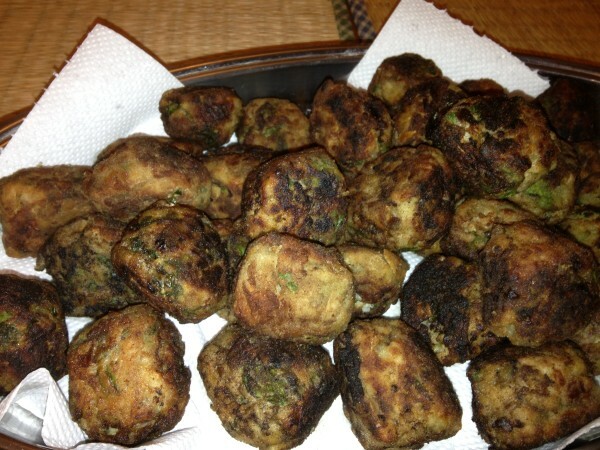 Fry the meatballs until they take a brown colour – careful they do not turn black. 11. When removing each keftethaki meatball from the pan, place it on a plate covered with a kitchen towel to absorb the excess oil from the frying. Serve the keftethakia Greek meatballs with our recipe for tzatziki (Greek yoghurt/cucumber based dip).